Quickly and directly study the role a protein plays in vivo with SBI’s Piranha Targeted Protein Degradation System, Electroporation-ready mRNA. After electroporating both the Piranha mRNA and an antibody specific for your protein-of-interest into target cells, you can start seeing degradation of the protein-of-interest in as little as 1 hour*. Piranha Electroporation-ready mRNA is available in untagged, RFP-tagged, or GFP-tagged versions (also available as Pre-packaged Lentivirus or HEK293T Stable Cell Line). 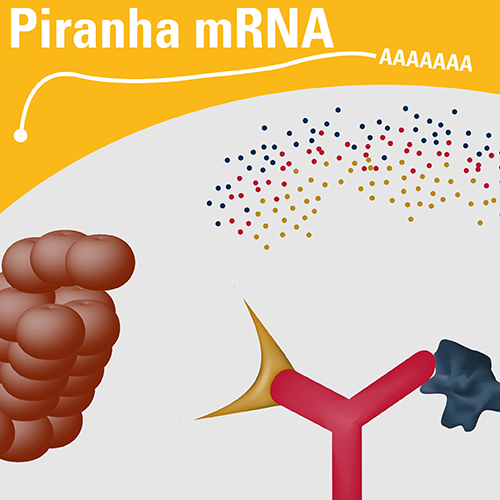 To use Piranha Electroporation-ready mRNA for targeted protein degradation, simply electroporate the Piranha mRNA and a validated antibody specific for the protein-of-interest into target cells, wait an appropriate amount of time, and then observe the phenotypic outcome. Because the rate of protein degradation is based upon many factors, we recommend performing initial experiments to empirically determine the degradation rate of your target protein and the optimal time for phenotypic observation.